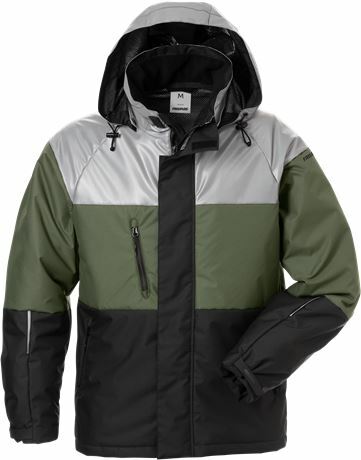 Soft padded functional jacket with reflective yoke and hood. 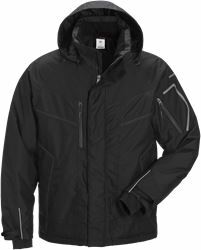 Windproof and water-repellent material with a special thermo regulation lining which reflects the body heat and gives comfortable warmth. Material: 100% polyester, breathable, wind and waterproof. Reflective fabric, 86% polyester, 14% elastane. Lining, 100% polyester. 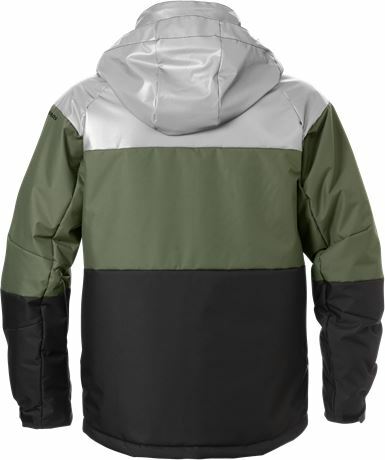 Weight: Outer fabric 150 g/m², reflective fabric 305 g/m², lining 190 g/m². 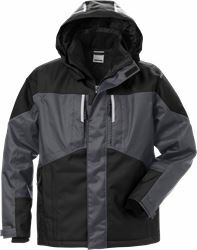 Breathable, windproof and water-repellent / Reflective parts on shoulders and hood / Fully padded and lined with climate control / Detachable lined hood adjustable with drawstring / Fleece-lined collar / Front placket opening with zip to top of collar and velcro fastening / 1 chest pocket with zip / 2 front pockets with zip / Map pocket accessible from outside / 2 inside pockets / Zip in lining for easy embroidery and transfer / Adjustable drawstring at bottom hem / Pre-shaped sleeves / Adjustable width at sleeve end / Elastic inner cuff with thumb grip / Approved according to EN 342 / OEKO-TEX® certified.